On the 18th April years 1 and 2 travelled to Barbados! We spent the morning making passports, packing our cases and learning about the country were going to visit. Then after lunch we used our imaginations. We went to the airport, passed through security and boarded the plane. After a safety talk we took off! On board we had drinks and a snack and watched the on board entertainment. When we landed in Barbados we went straight to our hotel to enjoy the pools, the beach and sample the local cuisine! It was a fantastic day. Have a look to see what we got up to. We learnt a poem called Five Little Sense All In A Row. We added actions and then performed it in small groups to the rest of the class. Do you know any poems off by heart? Said the nose, Don’t cause a stink! Together we make a lot of SENSE! Year 2 have made up their own rhymes all about cooking. Year 2 have been learning all about traditional tales. We retold the story of Little Red Riding Hood and performed it to the rest of the class. Once upon a time there was a little girl called Red Riding Hood. One day Little Red Riding Hood's Dad told her to take some food to her ill Grandma. On the way she met a wolf and told him what she was doing. He went to Grandmas house and locked her in a cupboard. He pretended to be Grandma but Little Red Riding Hood spotted his big eyes, ears and mouth! He ate Little Red Riding Hood. Luckily a woodcutter heard her scream. He killed the wolf and saved her. Years 1 and 2 have been rehearsing their Christmas play today. We are really looking forward to performing it for you soon. Today, we are learning all about Lady Godiva. Use the links below to research further. When was Lady Godiva born? 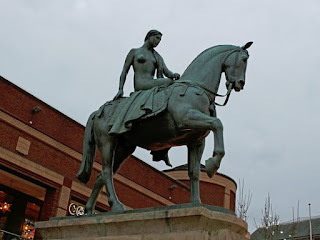 Who was Lady Godiva married to? Why was Lady Godiva famous? Where did Lady Godiva live? Where can you find a statue of Lady Godiva? Labels: Today we enjoyed learning about staying fit and healthy. We now know what sorts of food to eat to keep our bodies strong and we know that we should do 60 minutes of physical activity every day!